Located right under the Sanctuary of Apollo Hylates, Zapalo Bay is propably the most spectacular beach in the Limassol District. It is a large bay which combines steep cliffs, fine brown sand, white rocks and crystal-clear deep-blue waters. The view from the top of the bay is stunning. The first thing that strikes the eye are submerged rocks , remnants of an old port, and the two small piers currently used by local fishermen. It takes some time to figure out how the fishermen maneuver in between the reefs. The west side of the bay has beautiful fine brown sand, shallow waters, making it ideal for relaxation. The large cape protects this part of the bay from south westerly winds, resulting in completely calm seas, where the only sound you can hear is the singing of birds flying in and out of their nests in the steep cliffs behind you. The feeling is magical. Moving towards the east part of the bay, you can find some old dinghies, lying on the shore or underwater, before reaching a wooden bench under a tent, one of the few spots for shade on the beach. The far eastern side of the bay is more rocky and the sea tends to be rough. Large flat rocks make great "orthopaedic" sunbeds to lie on but do make sure you take a hat, sunglasses and plenty of water with you. 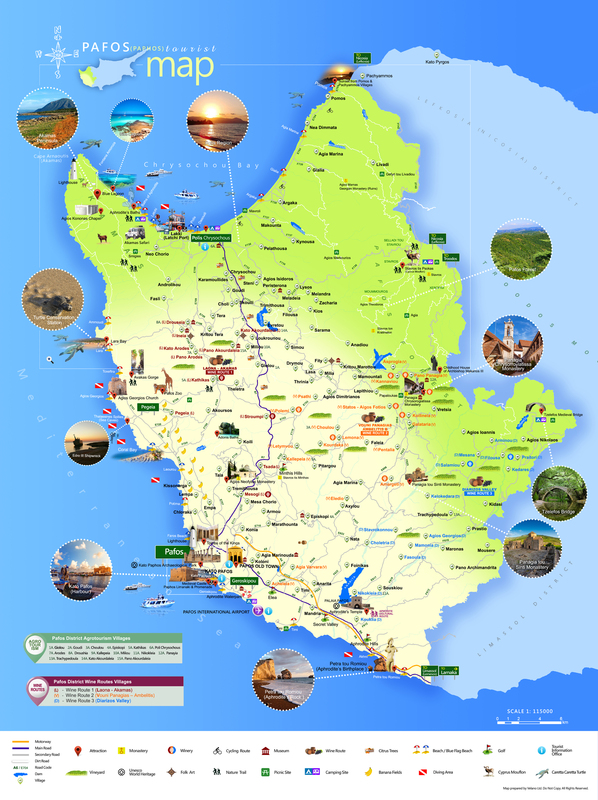 You can get there from driving to Pegeia and then to Agios Georgios. The sand is soft and golden, while the sea is crystal clear and clean. A 4×4 vehicle is necessary to reach this expansive and virtually deserted beach. One of the best beaches you will come across throughout the entire island, Lara bay serves as a sanctuary to the protected Green Turtle (Chelonia mydas) and the Loggerhead Turtle (Caretta caretta). Provisions are constantly been made for safe sites for the egg laying of these sea creatures. Everyone has a different idea of paradise and at first glance a new venture in Latchi comes close. Near the Anassa hotel, the entire area is known for its natural beauty. 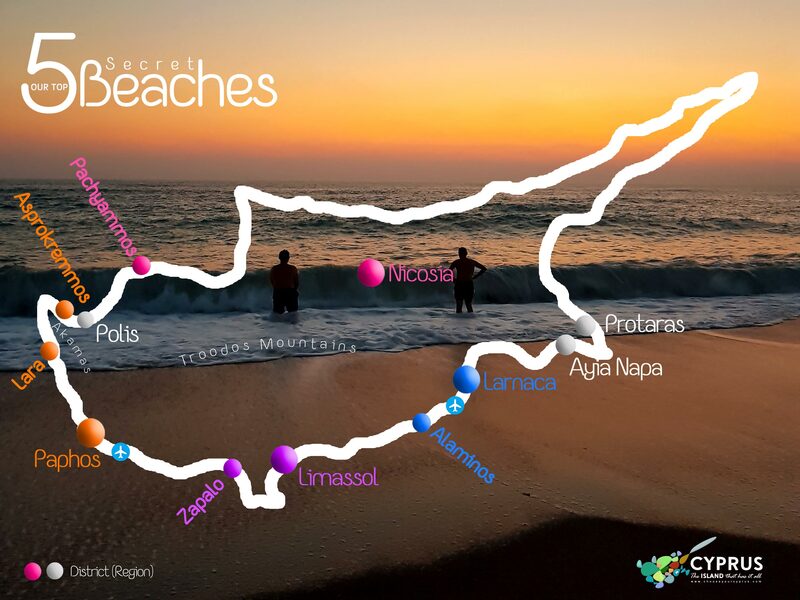 To reach this beach you have to take the route leading to the monumental bath of Aphrodite. This beach with golden sands and tiny golden pebbles looks very vast and is an ideal beach for long walks and cozy evenings. The restaurants and bars lining the beach offer an array of mouth watering food and drinks, the town of Latchi has various resorts which offer beautiful views of the bay, the transportation of the town is very well established and you can use local buses which are at regular intervals or you can even hire taxis, close to the beach is the Akamas peninsula situated on the west side, on the eastern side of the beach is the Pomos point. The areas near the small village of Pachyammos are majestically beautiful and the mountains lead straight into the sea. The main point of interest is the impressive church of Agios Rafael, an important pilgrimage site for the faithful due to the belief in the miraculous curing powers of the saint. Pachyammos Village Beach is an idyllic refuge for those seeking a remote and private stretch of bay to enjoy their day in tranquility. The village of Pomos, which lies on the outskirts of a beautiful bay, is surrounded by steep hillsides. Alaminos beach lies along the Larnaka-Kiti stretch of coast. Virtually hidden from plain sight it is a veritable ‘Secret Paradise’, in actual fact this is indeed what it is called. It is almost hidden from common view and it is truly a secret paradise. In order to get there you must turn off-road. On the shores of Alaminou, away from the sight of man, there is a secret paradise for swimming. This area was difficult to access until a few years ago. With the creation of the fishing refuge in two years, a paradise was formed. A large parking lot is a few metres further from the beach. There is a footpath with begins from the beach and ends one kilometre further down in the new tourist area Aldiana Zypern. The fishing refuge can accommodate hundreds of boats. The beach offers all the facilities which a visitor may need such as rent a sunbed or an umbrella and the prices are on display. The kiosk offers many types of drinks at supermarket prices and not those of a tourist kiosk.